A project costing 5 million Australian dollars is near to completing its first stage. H type tram 380 (formerly 359) is nearing completion of its renovation. 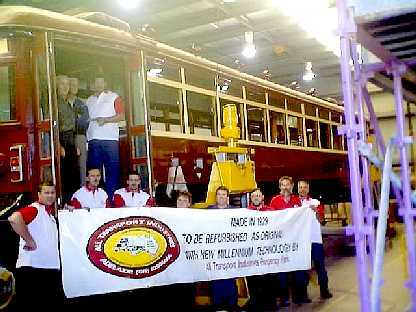 This is the first of five trams to be renovated by private enterprise, the first time such a contract has been undertaken. 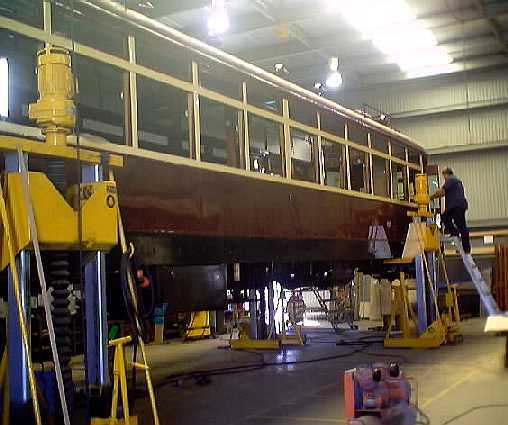 Previously all work of this type was completed by Trans Adelaide and prior to that the State Transport Authority, the Municipal Tramways Trust and the South Australian Railways. The main contractor in this enterprise is All Transport Industries owned by Rocc Giglio, with specialist work provided by Electronic Enterprises Australia LTD, for the chopper unit, and Allied Engineering Pty LTD for refurbishment of the trucks and other heavy engineering work. 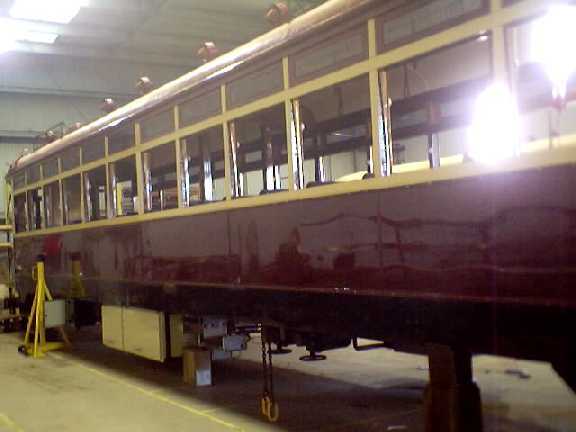 The main emphasis has been to maintain the original appearance of the trams, but to introduce new technology as much as possible. 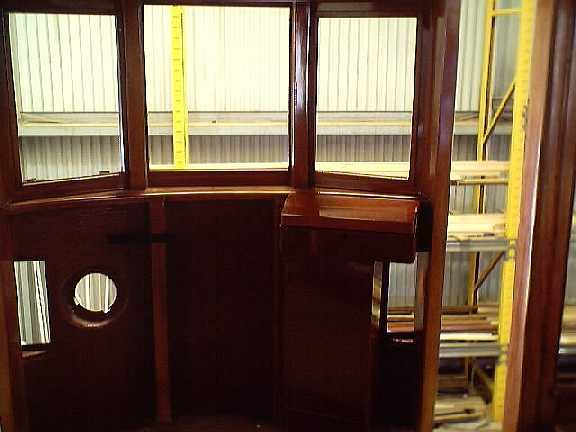 The driver's cab has a new fiberglass front, reinforced with box steel section; this is contained within the fiberglass and hidden from view. Air conditioning has also been included for the driver's comfort. 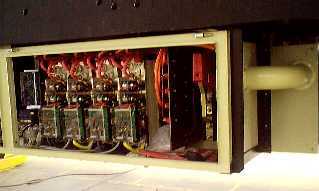 The original General Electric PC5L2 controls have been reinstated, but in fact are replaced by a locally designed chopper unit. This electronic unit is designed to reduce brake block wear, improve braking performance, and to reduce damage to motors from notching up too quickly, and emergency braking. The existing PC5L2 CASING has been stripped of its fingers and replaced with electronic circuitry. The heart of the unit is contained in an under floor, sealed, air conditioned casing. 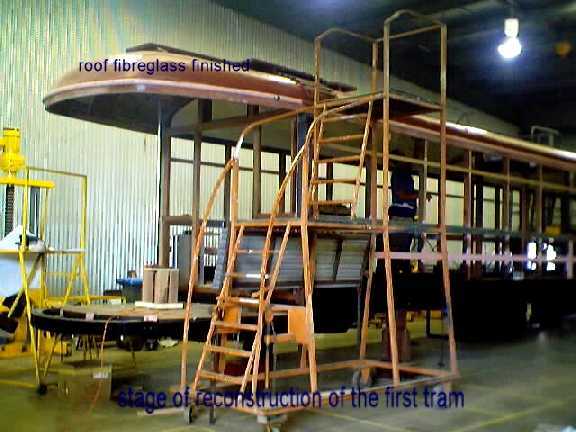 The frame of the tram itself has had several changes made. The door operating systems are now of a 'smart door' system, provided by SMC Pneumatics which opens the door automatically if someone becomes trapped in them. The corner posts are now constructed in box steel, replacing the old blackwood timber. Roof construction has been upgraded to include a fiberglass coating. Tinted glass has been refitted to all windows, with gas struts included in the vertical sliding sash windows to aid in their operation. Fluro lighting has been added to the centre ceiling, and new buzzer buttons and stopping signal signs. 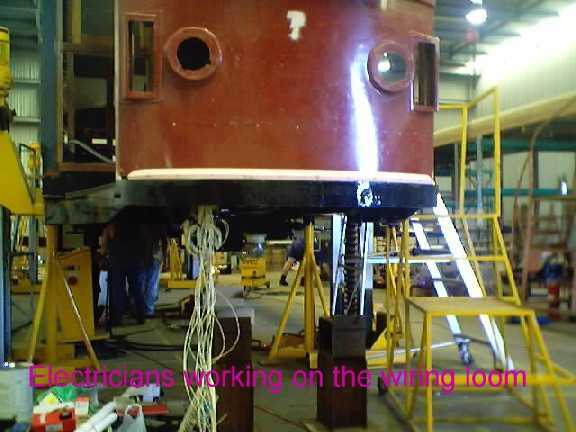 Other improvements include extra pins inserted each side of the couplers as part of the chopper unit upgrade, air piping has been replaced in copper, with flexible hoses to couplers and compressor tanks, and new air tanks have been fitted. Most of the new wiring runs under the floor unit in flexible conduit instead of in the window trunking, and improved sanding gear has been fitted. The driver also has a new seat of a type borrowed from the defence industry. (The majority of the technical information in this summary has been provided from an article by Kym Smith, a local tram buff, who is a the moment working with myself in Adelaide, but is soon to been heading a department in the Bendigo Tram Museum, maintenance division. I wish him the very best of luck in his new venture). 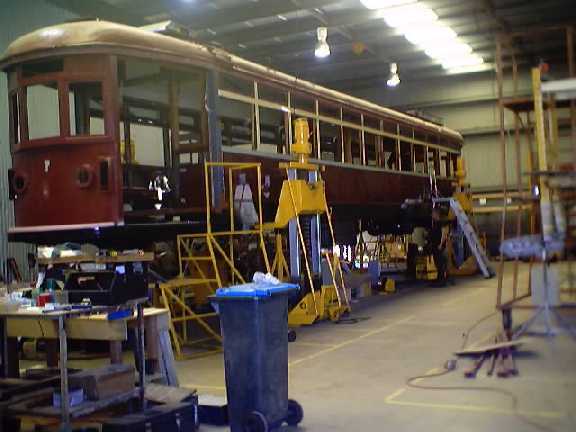 This one shows the first tram, the chassis has been away to the repair shop, has been straightened (it was involved in a vehicle accident some time ago) and extra strengthening added, and is now reunited with it's roof. You may be able to see the corner posts are grey painted steel section. We have just rebuilt the gangways, for access to the pantographs (to be re-fixed at a much later stage). The original roof vents are to be replaced with dummy look-alikes. 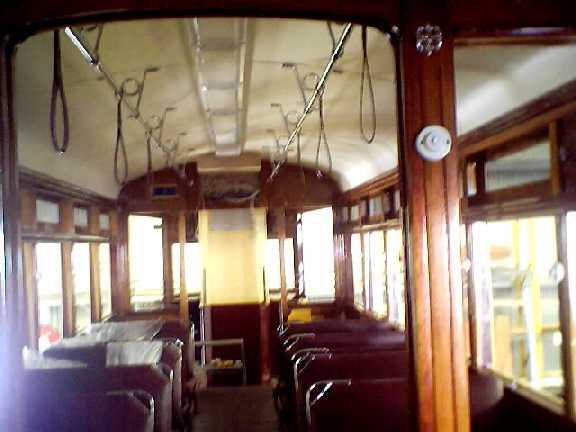 The driver gets air conditioning, but not the passengers, since it has been decided to retain the old style of window. 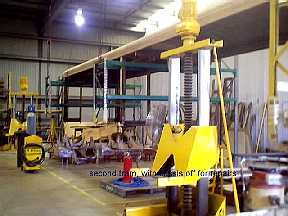 These are to be made in timber grain fiberglass. The main corner posts are now tube section steel to comply with occupational health and safety regs...to form a crash cage. We have removed all of the existing lead paint from the ceiling in the driver's area, and have stained and polished the ceiling bringing it back to its original glory. The front panel has just been re-installed at both ends. This area more than most is to "benefit" from modern technology. The old fiberglass front has been remolded to incorporate a steel frame as crash protection for the driver. 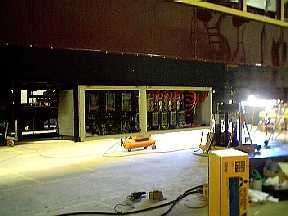 Steel tubing lines the passenger entry doors, as further protection, and the main corner posts are also in box steel construction. 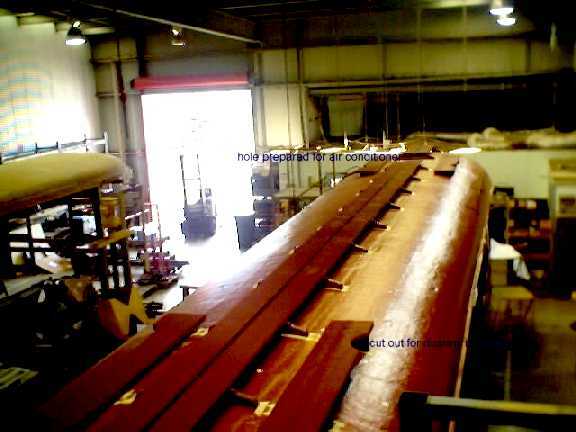 The fiberglass has had a simulated wood grain painted on and sealed. The box to the right has a lift-up lid to reveal an instrument panel. This is where most of the new technology is to be held, with electronic control equipment, which replaces some of the old mechanical and electrical equipment. The roof lining in at last, this is a flexible ply with several coats of high quality paint to finish. Apparently a practical answer to frequent acts of vandalism. 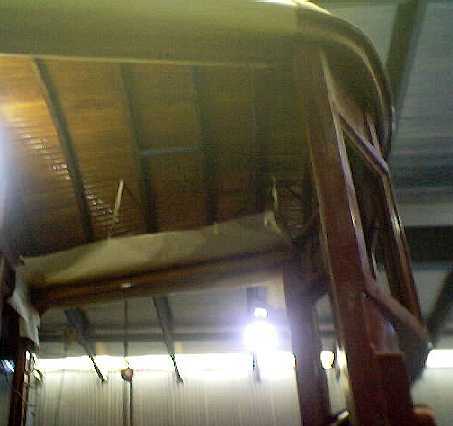 The original blackwood linings are used and going back in place after a great deal of cleaning and t.l.c. 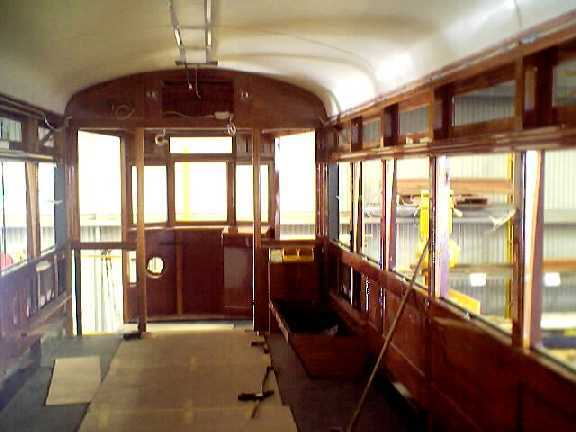 We have two guys from Alelaide tram museum who are doing the staining, colouring, and polishing of the timbers. The floor lining is down, a high-density industrial vinyl.